It’s Mullet Toss Weekend in South Alabama. 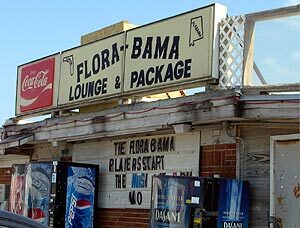 On the Florida/Alabama state line, there’s a little place called The FloraBama Lounge & Package. It’s a pretty famous roadhouse with even a few songs written about it. 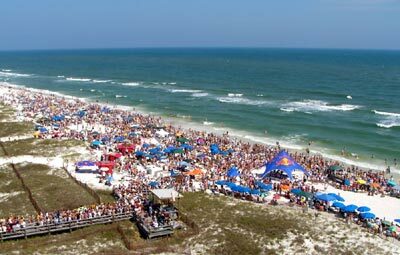 And, each year on the last full weekend in April, the FloraBama sponsors the Interstate Mullet Toss. The Mullet Toss is exactly as billed. People enter and compete in various age divisions (similar to 10k races) to see who can literally throw a mullet the farthest. Competition is serious and intense. To reward the victors, and the losers for that matter, is music and ice cold libations a plenty. The weather is absolutely gorgeous today, so it should be a very successful “toss”. Just the ambiance of the FloraBama is worth the trip. …all roads lead to Wet Willie, baby. Back in early June, I did a post on Jimmy Buffett and his Parrothead phenomena. At that time, I downloaded his new “album”, Bama Breeze, from iTunes. I knew, immediately, when I heard the title track that it was about the FloraBama. The Last Great American Roadhouse. Just last week, Jimmy hisself gave confirmation that indeed, yes, the song was written about the FloraBama. The video he produced for the song, however, had a more general message regarding the destruction along the Gulf Coast of dozens of FloraBamas. As I’ve previously mentioned, Jimmy Buffett grew up in Mobile, AL. He attended St. Ignatius Catholic Elementary School and later, McGill-Toolen Catholic High School. His parents lived “over the bay” until their deaths in recent years, and his sister, Lucy (Lulu) owns Lulu’s at the Homeport at the base of the Intercoastal Bridge in Gulf Shores. Matter of fact, Jimmy refers to “Lulu” singing Freebird in Bama Breeze and she actually performs that part in the video. The Buffetts are no strangers to “storms”. When you live on the Gulf Coast, a/k/a “Deep South”, it’s a way of life. Sometimes you go years with nary a scare of a storm, and then sometimes you have to endure six or seven “hits”. Even with the dangers each year, the majority of folks who reside from Corpus Christi, TX to Key West, FL wouldn’t live anywhere else. Sadly, any time a “storm” is in the Gulf of Mexico, multiple areas usually feel the effects. Living in the central portion of the Gulf Coast, we’re always “in the line of fire”. I grew up 30 miles off the coast of Louisiana and went through ONE category 5 storm, Hurricane Andrew, back in 1991 when we were living in Baton Rouge. Everything before that (nearly 30 years), was limited to the inconvenience of lack of power and air conditioning for a brief period, but little else. While Hurricane Katrina exposed the ultimate vulnerability with the flood of New Orleans and the suffering that it brought, many Gulf Coast cities and towns have suffered similiar tragic consequences but are not etched in the minds of most Americans. The Mississippi Gulf Coast of Gulfport and Biloxi was annihilated by Hurricane Camille. Hurricane Audrey drowned hundreds in Cameron Parish, Louisiana. Mobile took five years to recover from Hurricane Frederick. And Homestead, FL will likely never be the same after Hurricane Andrew. Among the casualties of these storms are the landmarks of our lives. Places like Annie’s Restaurant in Waveland, MS; Circle Grocery in New Orleans; and yes, the irrepressible icon of Alabama and Northwest Florida — the FloraBama. While the destroyed bar from which Jimmy performs in Bama Breeze is/was actually The Fire Dog Saloon in Bay St. Louis, MS; that is basically what the FloraBama looked like after Ivan. 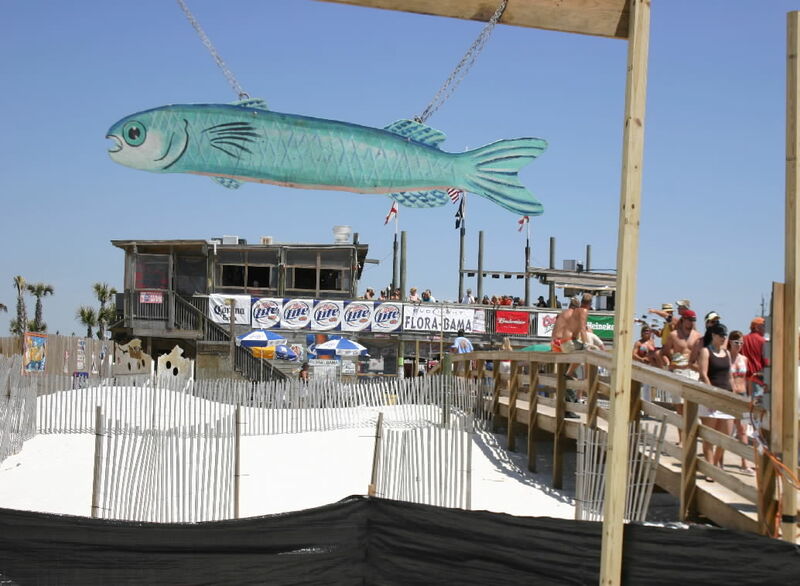 While much of the dunes and sea grasses were destroyed, the Mullet Toss — and the FloraBama — is alive and well, a testament to the nature of the Gulf Coast inhabitants. 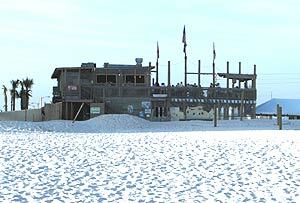 The FloraBama is more than just a beach “dive”. It’s one of those places where there’s always good music, cold beer and no judgment. It’s a vacation spot to let loose and just be. The echoes of laughter, the smell of stale beer and the feeling of freedom continue to permeate through this oddly wonderful icon of the Gulf Coast. 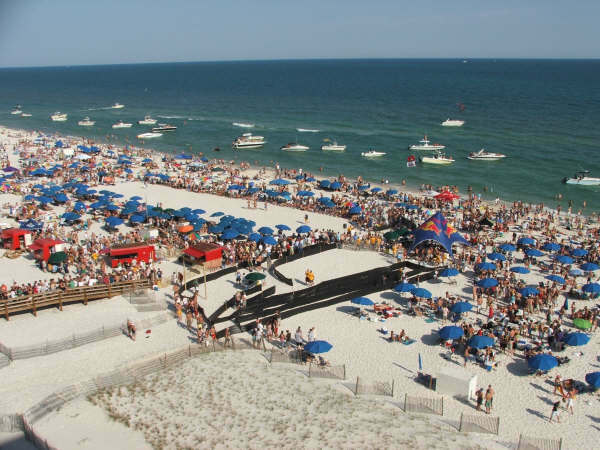 Although not totally rebuilt, the hodge-podge of tents, roofs and buildings are certainly “good ’nuff” to still be the jewel of the “Redneck Riviera”.